Blood in the Red Rocks is my first published work, a Sedona mystery/suspense novel. After reading nearly two hundred mysteries in the past two years, I got the urge to write one of my own. 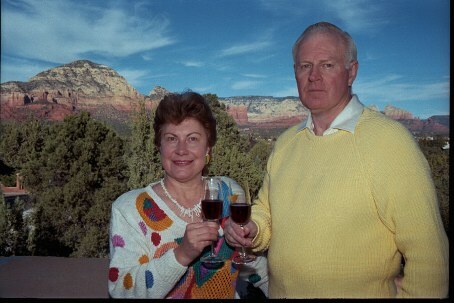 Living in Sedona inspired a wealth of plots and large cast of characters. We moved here in 1988. Since then, my now retired husband, former Captain on 747-400s, and I have enjoyed much that Sedona has to offer. The history of Sedona is an especially interesting subject for us. Taking my young protagonist, Danny, to some of Sedona’s special landmarks and architectural creations, gave me the opportunity to educate and share. The symbolism of “blood” inspired religious connections, places with history of bloodshed, and murder. Having worked as a RN, I certainly saw my share of bloody wounds. There was also surgery (where I once dropped a skin graft on the floor, causing the surgeon to fling his scalpel, nearly resulting in my blood being shed). A need for more adventure in my life probably initiated my employment as a flight attendant, formerly called “stewardess.” That is how I met my future husband, Bruce, pilot for United Airlines. I recall the occasion when I was a stewardess working the first United flight out of O’Hare in Chicago. There were corsages for the two attendants on the DC6 and lots of flash bulbs popping. Yes, I met many characters in my early careers that would slip comfortably into any novel today. We even had time to sit and visit with passengers in that era, leaving me with entertaining stories and opportunities for celebrity name-dropping. Growing up in North Dakota next to the Missouri River, on the land where Lewis and Clark wintered during their journey to the Pacific Ocean, I fell in love with the scoria-red buttes there and the Native American history of the area. Today, many people, who knew me then, ask if it were those scoria buttes that led us to move to Arizona’s Red Rock Country. Maybe. Certainly most people find the beauties of Sedona awe inspiring. I know I love living here surrounded by vistas that dazzle any time of year, almost any time of day or night. The stars are bright beacons in the sky most nights. One early morning during a meteorite shower, I nearly got whiplash cranking my head around to observe all the falling stars. The spectacle of a lightning event during the monsoon season brought us to attention the night we moved here. Crime in Arizona is certainly not a unique concept. There are drug problems, homicides, and other examples of violence in our often violent world everywhere. Crime that occurs in Sedona does not deter us from our enthusiasm for the city. Yes, I love Sedona. I’m sure I’ll be working on my Sedona web sites and Sedona books until I’m at least ninety!